Delhi Agra Jaipur Tour What to Discover? 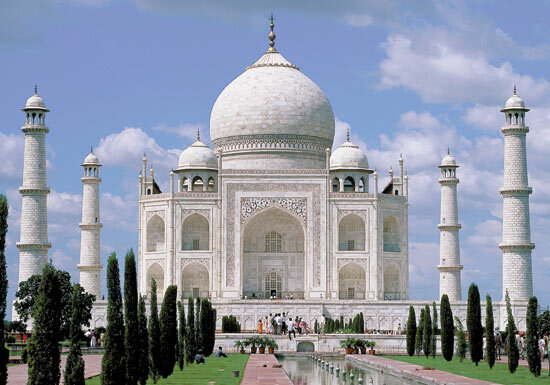 Taj Mahal is expression of supreme beauty build in white marble under Mughals. Complete architecture of the building of Taj is very unique but symmetry in each corner makes it incredulous. The main part of Taj is the tomb; on the four corners of the tomb four minarets are placed. The graves are at the lower side in the main chamber houses. The cylindrical shaped dome of the Taj is a brilliant feature of the architecture. Taj Mahal gardens are the wonderful element of the monument. Surrounding of the Taj Mahal has pathway that divided gardens in four quarters. A marble water tank called Hawd al-Kawtharlay from the gateway to tomb, where get the reflection of mausoleum. These four green gardens in complex of Taj put more liveliness and blue sky gives a perfect background to the incredible monument. The complex is surrounded by three walls of red stone. There are some other mausoleums which are of other wives of Shah Jahan. At the end of the complex there are two red stone buildings, which are exactly similar. One is mosque and other is called Jawab referred as guest house. There is a great art work in the monument that adds more charm in the beauty. Internal part of the Taj Mahal has complete traditional touch in the work of building. Internal side of the tomb is of octagon shape structure. Inside octagon marble walls has Jali work, it is just unique & fine artwork form. All the work on marble walls has flower and fruit designs. Decoration of the monument shows the different art work on the marble and red stone. Carving, painting, pietra dura and lapidary of precious and semiprecious gemstones are all these work art form used in the decoration of the amazing beauty of Taj. 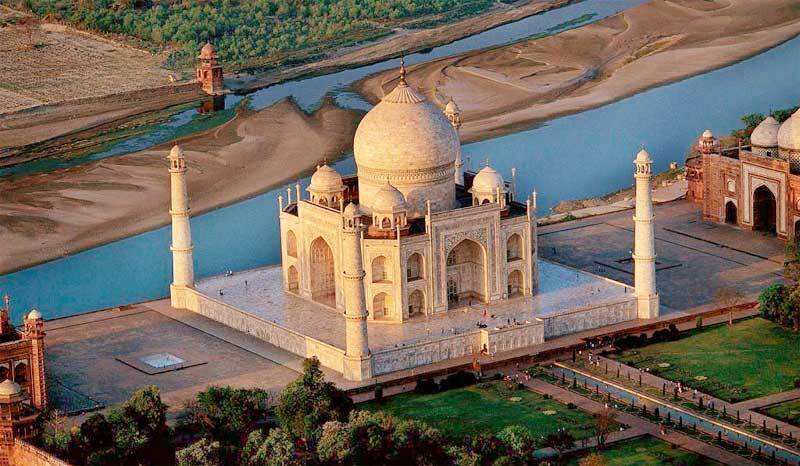 Agra city is known for its art, culture, and heritage which attract tourists to visit this place. The monuments and structures still existing in Agra is mostly developed by Mughal Kingdom and it had ruled this city for a long duration of time. It is the city of historical monuments and structures. There are many ways one can reach Agra. i.e by train, car or by flight. 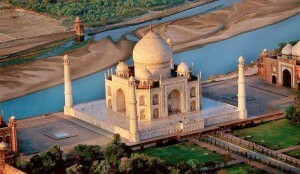 we offer spacial Tour to Agra from Delhi on train.Our package starts with a luxurious train from New Delhi to Agra. It gives you an opportunity to experience a leisure journey on high speed train. It is a affordable package that offers you a chance to visit Taj Mahal, Fatehpur Sikri, and Agra Fort. It is air conditioned transportation service that we offer to our clients for Agra tour. You are requested to leave hotel early in the morning and depart station with our representative by 6 in the morning. A fabulous breakfast will be served up in royal fashion. Our tour is divided into two parts with morning hour tour and evening hour tour. Morning is associated with visit to Fatehpur Sikri, which takes only an hour to reach from Agra and it is 35 km away from Agra. After visit to Fatehpur Sikri and its awesome art, culture, and heritage, you will get a nice lunch at Taj View hotel in Agra. In afternoon hours, you will get visit to Agra Fort and Taj Mahal. Taj Mahal is most attractive building and it attracts not only the domestic but also foreign tourists. It is among Seven Wonders of the World. There are also shopping markets and malls where you can go and buy gifts and other things which is memorable to your visit to Agra. In case time permits with Taj Mahal Tour, you will get visit to other places nearby.Akbar Tomb is prime center of attraction to tourists. This tomb is built with sandstone that has been used to give a wonderful designing to it. It is also a nice greenery surround this tomb. Akbar by himself plans whole site and customized designing with it. With us, you get a train ticket, breakfast, and lunch with a five star hotel. We also offer you the pick-up and drop off facility along with sight seeing. English guide is also made available all the day briefing you history and interesting stories related to Taj Mahal and other places. It is required to make advance booking with us for tour package to Agra along with correct name and address of hotel where you stay.